Scripture tells us to “always be ready to give a defense to everyone who asks you a reason for the hope that is in you” (1 Peter 3:15). The questions we’re asked may be tough, but finding the answers doesn’t have to be. Finally, an apologetics course that’s unintimidating, taught in the same casual, conversational way you’ll be sharing what you learn—over coffee with friends. 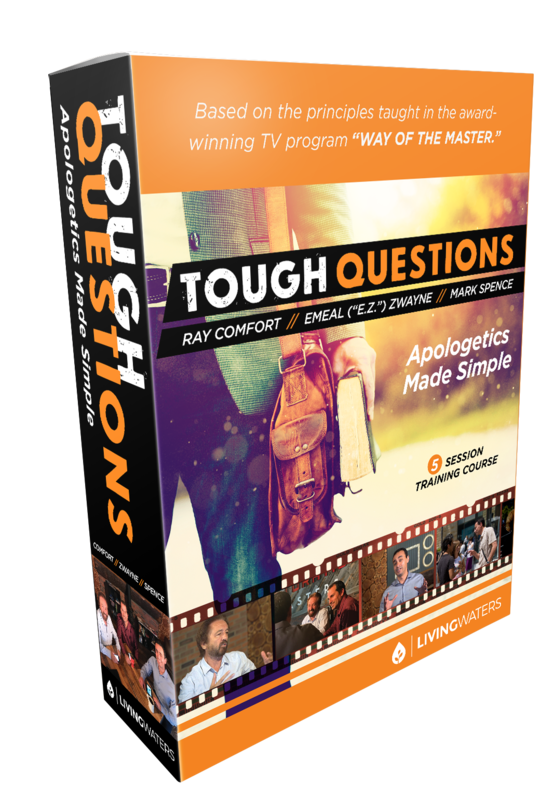 In “Tough Questions,” Ray Comfort, Emeal (“E.Z.”) Zwayne, and Mark Spence will not only equip you to have ready answers to the questions you’ll face, but will arm you with an arsenal of valuable questions of your own. You’ll learn simple ways to help people think through their beliefs and to reason with those who may seem unreasonable. 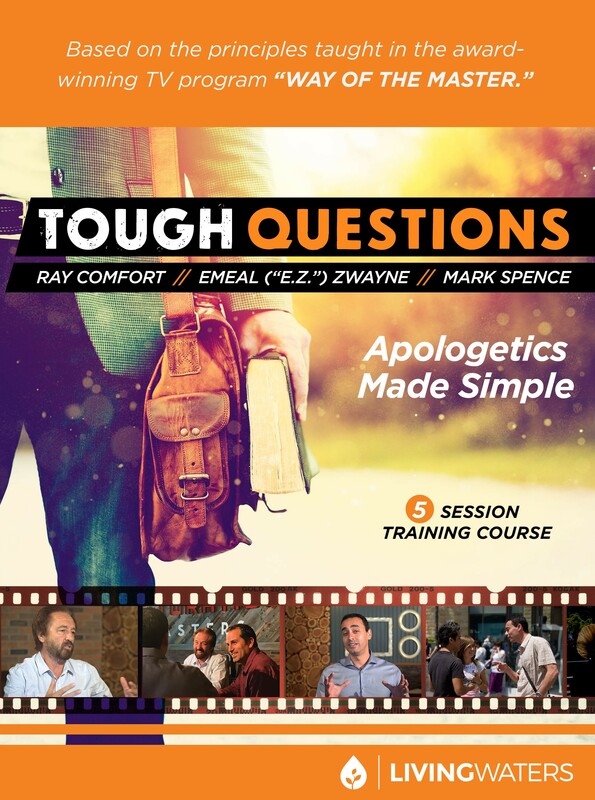 In these five sessions you’ll explore what apologetics is (and isn’t), its proper role in evangelism, the fundamentals of worldviews, and the biblical key to unlock the heart of the ungodly. Most importantly, you’ll be given tools to have life-changing conversations with friends and strangers as you share the truth of the gospel, pointing people to the only Answer they need. Why is there suffering and evil? How can a loving God send someone to Hell? Isn’t the Bible filled with contradictions? Printable bulletin insert and postersRAY COMFORT is the Founder and CEO of Living Waters and the bestselling author of more than 90 books, including God Has a Wonderful Plan for Your Life, How to Know God Exists, and The Evidence Bible. 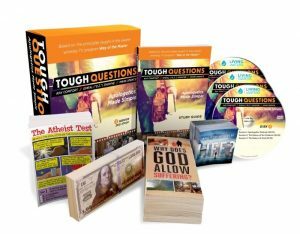 He cohosts the award-winning television program Way of the Master, airing in over 190 countries, and is the Executive Producer of “180,” “Evolution vs. God,” “Audacity,” and other films. He is married to Sue and has three grown children, and hasn’t left the house without gospel tracts for decades.EMEAL (“E.Z.”) ZWAYNE is the President of Living Waters, the official spokesman for the National Bible Bee organization, and a cohost of the National Bible Bee Gameshow. He serves as the Executive Producer of the Way of the Master television program and all Living Waters films. A dynamic communicator, he speaks at conferences and churches nationally and around the world. E.Z. served as an associate pastor for several years. He and his wife, Rachel, have five children. MARK SPENCE is the Vice President of Outreach at Living Waters and the Dean of the online School of Biblical Evangelism, with over 18,000 students enrolled since its inception. A popular speaker at conferences and universities, he also cohosts season five of the television program Way of the Master, engaging skeptics and equipping Christians in evangelism and apologetics. 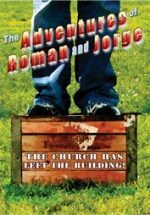 A former assistant pastor, Mark is the Producer and Editor of several Living Waters films, and he and his wife, Laura, homeschool their five children. Be the first to review “Tough Questions 5-Session DVD Study” Click here to cancel reply.